My foster family is adopting me! Hi. My name is Dolly and I am named after Dolly Parton and well, you can probably see why. It's not that I can sing. I have a big dewlap that just makes me look even more impressive than I already am! 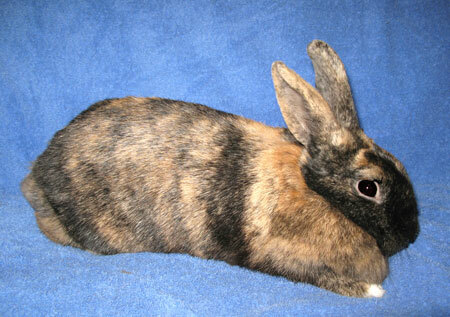 I am a GORGEOUS,spayed harlequin girl with stripes and patterns of color that almost make me look like a mix between a tiger and a rabbit. I am a friendly girl who is both easy on the eyes and a nice bunny. I am currently living in a group with Alouette,McDreamy, Teardrop,Cyan, Feather and Humera. Maybe you can adopt one of my friends to go with me? I am likely an older girl with some chronic respiratory stuff, like sneezing, just so you know. Hopefully, that won't hold you back from loving me!